I got the job! I will be what they call a tutor. It’s part time. One class will be at my local primary school (that’s what they call a middle school, college is high school and uni is university). The schools throughout the city contract with CYT to have a tutor come out once a week and teach a drama class. It so happens that she needed someone for the Turner school so I can easily walk there. This class is really a beginning acting – theatre games, pantomime and storytelling – much of what I did with my Drama 1 classes at the high school. At the end of the semester the students put on a little program for their parents. The other assignment is to co-teach a class on Melodrama at the CYT center. This group is the 13 – 25 age group. The parents pay for the kids to take part in a variety of acting and technical theatre workshops offered each semester. I will teaching kids who want to take drama and whose parents are motivated to keep them attending. The melodrama class should be fun. Again at the end of the semester they will perform a short melodrama for parents and friends. This class is also on Thursdays after school. The CYT has it’s own theatre building where they rehearse and perform. Pip said that she rarely has discipline problems because the students really enjoy being involved. One of the groups is the Ensemble group. This is a group of students who have taken classes at the center before. They audition to be in the ensemble group and then they do a full blown production. They rehearse on Saturdays from 10 to 4. The public pays to see their productions and from what I hear they do some really outstanding work. CYT is funded not only by enrollment fees but also my the federal and state arts councils. Pip also applies for grants. She recently got a grant to create a new work for the Ensemble group to perform. Pip had just cast the show at the beginning of the week and they were going to have their first rehearsal on Saturday. Since it would be their first read through I asked if I could volunteer to help with this play so that I could get to know more about how the organization works, meet more students and help with anything she might need. It just so happen that this week the playwright, Ross Mueller from Melbourne, the set and costume designer, Tobhiyah Feller from Sydney were going to be there. Toby and Ross are professionals (young but successful – Ross has written many plays and Toby has a design studio in Sydney). Toby presented her costume and set designs to the cast – a group of about thirteen 16 to 22 year olds and one 10 year old girl. I will try to get photos once the set is built. During the read through, Ross and Pip continued to make small revisions to the work. The play is an adaptation of a young adults novel called “The Messenger” by Markus Zusak a popular Australian novelist. The group did the read through and I was impressed with many of these young actors. On Sunday they did a mini read through presentation to an audience of arts council members, sponsors and parents. Pip gave a short presentation on the process thus far, the cast read scenes one through five, Ross discussed the writing process and the audience asked questions. It was a wonderful afternoon. When Pip introduced the key players, Ross, Toby, Sharon the office manager, Lonnie the stage manager, and the sound designer, she also introduced me as the center’s newest tutor and her assistant director for this play. I’m finally beginning to be a part – even if it’s only a bit part. Learn more about CYT . No Kelly, I’m not talking about those Aussie hunks, I mean real WILD ANIMALS!!! 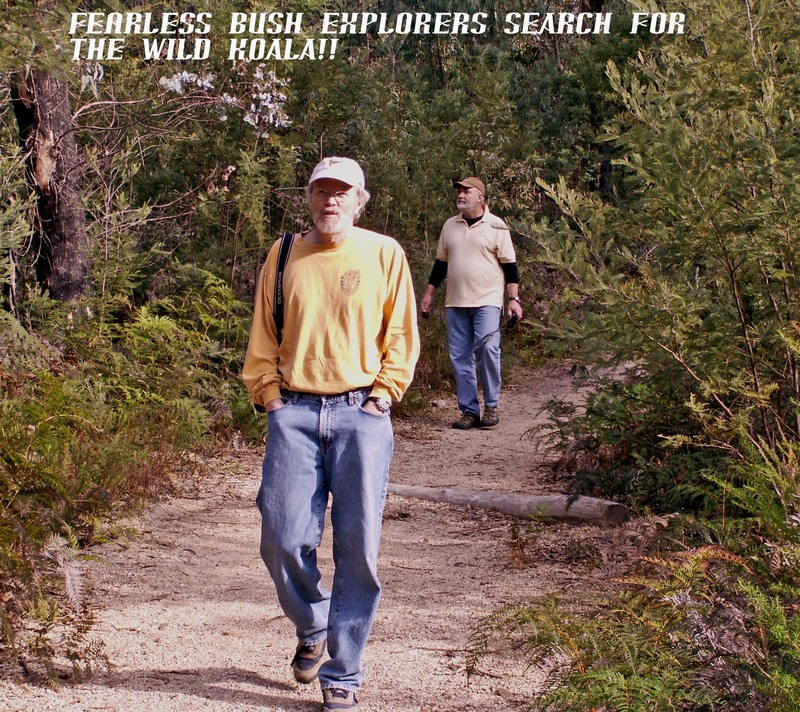 We went to Tidbinbilla Nature Reserve yesterday with Pat and Britt Moore. We saw mobs (yes that’s what a group of kangaroos are called) of roos, amazing birds, two real koalas but sadly no platypus (at least not this trip). It was probably one of the best days we’ve spent here so far. 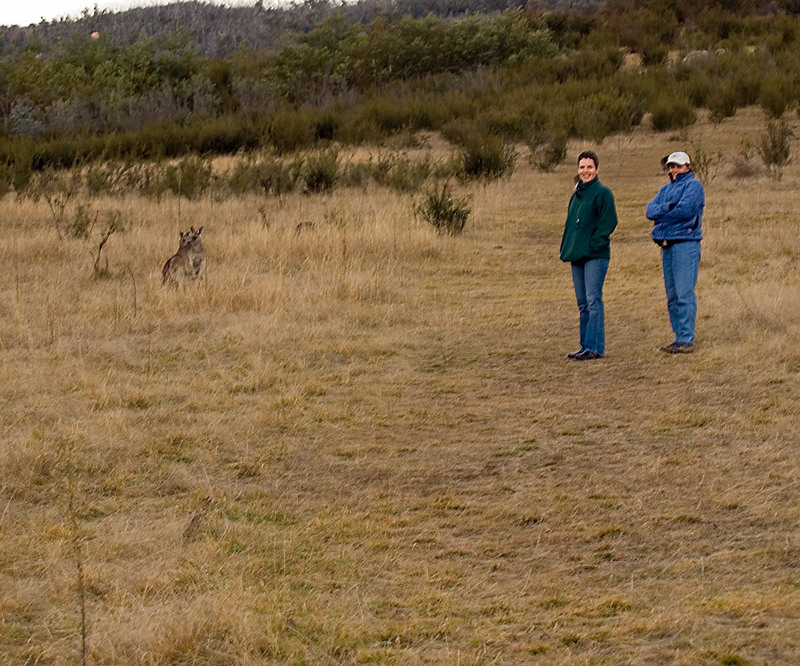 The Tidbinbilla Nature Reserve is miles and miles of hills and valleys protected for the native vegetation and animals. It’s only 30 minutes from Canberra. Now the reserve is not really the wild because some of the areas are fenced to keep “predator” animals out. There are pathways for easy walking and specially designed wetland areas to attract some amazing birds. 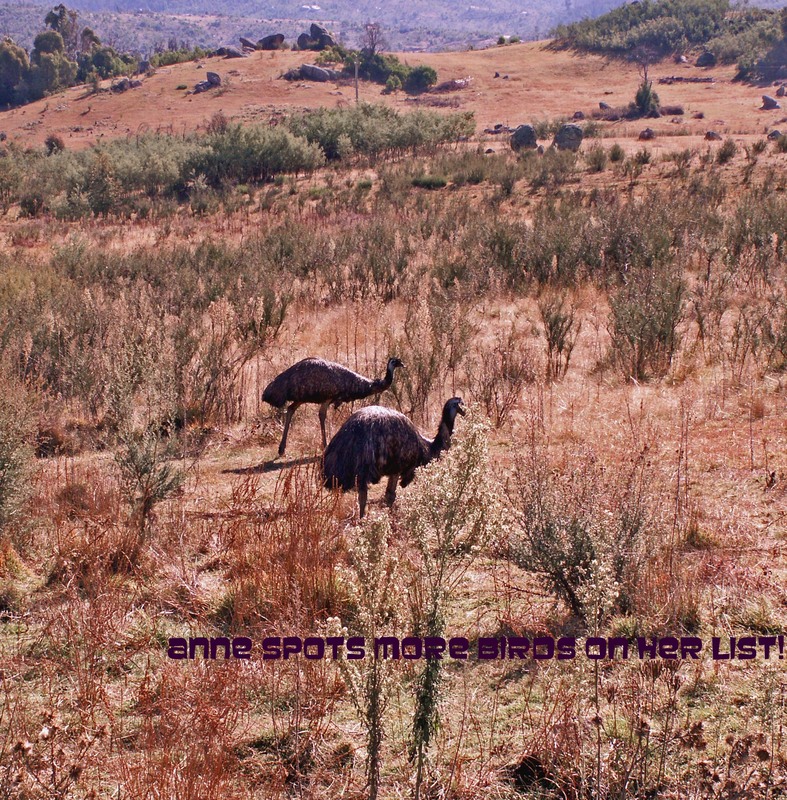 Our first encounter was two emus grazing along the side of the road. They are so big maybe three to four feet tall, I’ll have to research that, but they were big. The funny thing is that as they started to walk away from me they made these cute little grunting noise more like a pig’s snort rather than a bird sound. Koalas are difficult to see. 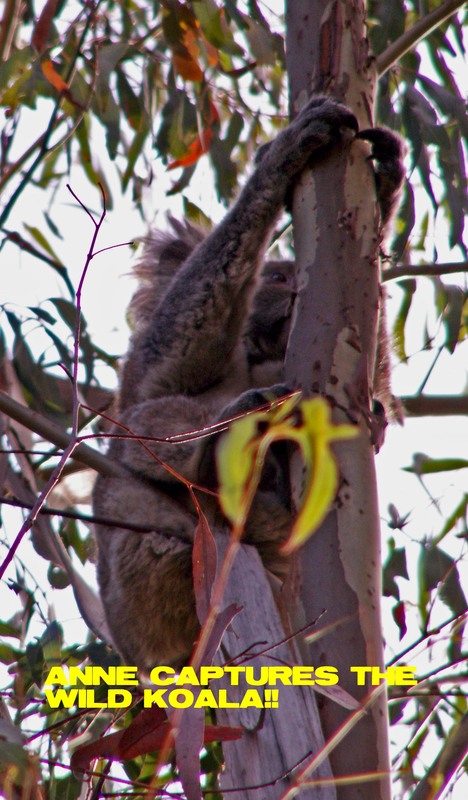 They are almost the same color as the tree bark and they sit in the crook of the branch in the tallest of trees hidden by the leaves of the eucalyptus. They hardly move so you need really look hard. Britt and I tended to do more talking than looking so our fearless koala hunters pointed them out to us. I got a couple of good pictures – by luck I must admit. 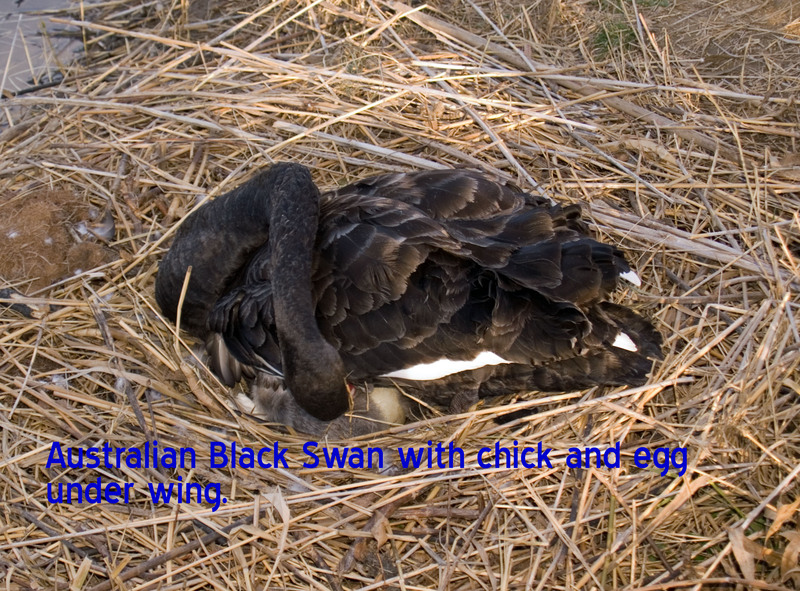 We came across a Australian Black Swan family – a nesting mom with a newly hatched baby and an egg waiting to pop any minute. 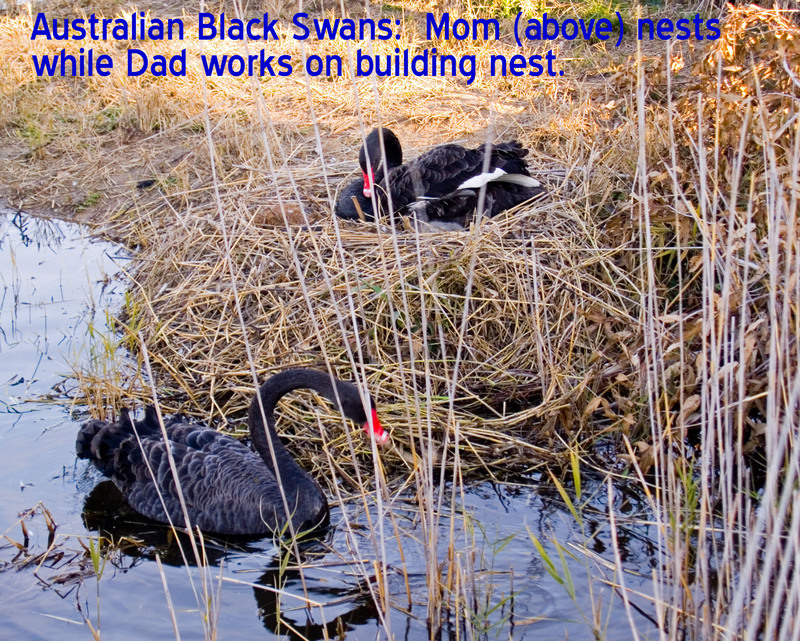 The male swan was doing a little home maintenance by adding reeds to the sides of the nest – very cool! We saw a two huge pelicans and a heron – so beautiful but the pictures we took didn’t come out. We also saw many unusual ducks – some with blue bills and one with a black waddle. We wanted to see a platypus – the lady in the visits center said quite a few had been seen in the past couple of days but we never found the right pond – we will be back. I just finished reading an interesting historical novel called “Love and the Platypus” about the man who went to Australia in the 1800’s to determine if platypus laid eggs or had live births. Having finished the novel the night before really peaked my interest to see this awesome animal in a natural environment. We ended this beautiful afternoon picnicking on top of ridge as the sun moved behind the far hills. In the valley below we could see kangaroos grazing. We walked in a large meadow where they were feeding – at one point I counted fifteen kangaroos of various sizes. Britt and I walked as close to them as they would allow us. They were curious about us but they didn’t try to approach us. I could see their eyes and the twitch of their ears. Their short arms (or are they called paws?) pulled at the grass as they balanced on their rear legs and long tail. They are truely an amazing animal to see. I am truly “Not in Kansas any more” but in the land of Oz. There are many things I Iike about living in Australia but I must tell you garbage and the collection of it really impresses me. They are very good about recycling here in Canberra and I’m assuming in the rest of the country as well. You get two trash containers(everyone has the same trash cans owned by the government, one for actual garbage – food scraps. etc. and one for recyclables). You don’t need to separate the glass from the paper, or the cardboard, you don’t have to take it to a recycle center, and you don’t have a tiny bin to put it all in you get a full size trash container for it all – in fact it is even larger than the regular trash can. They pick up the trash every week but only pick up the recycle bin every other week. They have these trash collection trucks that grab the bins and tip them into the collection truck. That’s the reason they all have to be the same style trash cans. The yellow lidded cans are the recycle bins. I tried to get a picture of that but my timing was off and it tipped it all in before I could snap the picture. At the markets – those weekend farmers markets- they even have two separate bins. Now this maybe happening in many places in the US but in Kansas they don’t even recycle unless you do it yourself and even then it’s hard to find a location to take your recycle materials to. In contrast if you go to a park or even in the malls you can never find a trash can. At the mall, the cafes or food stands may have some trash cans, and the food courts have them, but you don’t find many as you walk thru the hall ways. Canberra is famous for it’s lakeside walking paths, the nature reserves, parks and green beltways through the subburbs (or what we would call neighborhoods). With all of this public access area you would think that they would provide trash cans along the way. But they are scarce especially when you need one. They encourage people to pick up after their dogs and for the most part people are really good about it – and we have been very diligent about taking a roll of blue poop bags with us – but then we have to walk around carrying these colorful but often disgusting packages of recycled materials from our dogs’ last meal. I don’t get it. Over all, Oz is a very “green” country. We (our little family) generate A LOT of waste – paper mostly from us and the other kind of waste from the dogs. It’s nice to know some of it recyclable. A kangaroo watching me watching him. Kangaroo hidden in the bush. I thought there was only one. Until a dog barked and they started running. I’ve been walking around Canberra almost every day. There are different birds here. You don’t see many sparrows, pigons, or starlings but rather white (very noisy) parrots, these black and white magpies-I think- and colorful parrots. The black swans were a real surprise. But yesterday I saw my first kangaroo since we got here. I was walking in a nature park – much like Tilton Park for those of you in Northern California – lots of walking paths thru treed areas and grassy hills. I saw something out of the corner of my eye, just a slight movment. Well there it was. It blended in much like deer in fact they are almost the same color as deer. It wasn’t frightened by me-they probably see lots of people since they are surrounded by city. When a dog started barking about 8 to 10 of them ran away. I never even saw the other ones. When you look at the pictures you’ll have to click on them to enlarge it so you can see them. It was pretty exciting. Or by the way we had a kangaroo roast for dinner about a week ago – very tasty, low fat, pretty cheap – I hope it wasn’t one of these guys mates.